Scientists knew something strange happened when they heard reports of a raft of floating rock near New Zealand back in 2012. That raft eventually grew to around 150 square miles—remains of the largest underwater volcanic eruption in the 20th or 21st century to date, bigger even than Mount St. Helens. But when researchers actually visited the Havre volcano, it was nothing like they expected. Instead of the explosive, underwater Krakatoa-type eruption expected, they found signs of slower-moving lava flows... and realized that a whole lot of data they could have been using literally floated away. 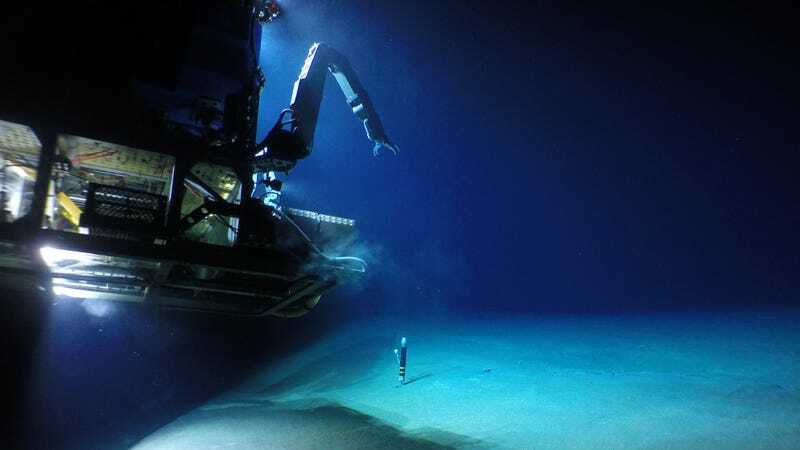 There really isn’t a whole lot of data on these underwater volcanoes, especially not data taken soon after the eruption occurs. The quantity of that floating rock, or pumice, implied the existence of an explosion. So the team of researchers from Australia, New Zealand, and the US, led by Rebecca Carey at the University of Tasmania in Australia, sent the autonomous vehicle Sentry to map the area and the remotely operated vehicle Jason to observe and collect the volcanic material. When the vehicles arrived at the site, they spotted signs of flowing lava, as well as domes from magma heaping around the vent—signs of a gentler, less-explosive eruption. These could potentially be the result of an eruption occurring at such high pressures so deep underwater, Soule thought. Sorry if you were hoping for an explosion, but there’s still a lot of mystery and important science to be done. The results prove that there’s plenty we don’t know about ocean volcanoes, which make up 70 percent of the magma Earth spits out according to the paper published Wednesday in Science Advances. It’s hard to directly observe these underwater volcanoes for obvious reasons, there’s no data on how long they last, and this is the only time one has been mapped shortly after an eruption. Even with this most recent observation, we are left with only more questions—why does some pumice float and others sink? How does the water depth affect the behavior of the volcano? On top of that, maybe the volcano was explosive, the paper continues—but the explosivity was just different from what you’d expect from your usual volcano on the Earth’s surface. More data is still needed to really determine what’s going on. And there’s no model to help scientists understand what happens to all that pumice that floats away. The material lost to the tides must remain “a source of uncertainty” when trying to understand these volcanoes. With all the science and mystery, “it’s really a cool volcano event,” said Soule.